Patients with Down syndrome have three copies of chromosome 21 in their cells. They’re also 20 times more likely to contract childhood B-cell acute lymphoblastic leukemia than the general population, making that chromosome an important avenue for researching the genetic basis of the cancer. “A major goal of my laboratory is to identify the specific gene – or genes – on chromosome 21 responsible for the increased incidence of leukemia in this population,” said study senior author John Crispino, PhD, Robert I. Lurie, MD, and Lora S. Lurie Professor in Medicine-Hematology/Oncology and Biochemistry and Molecular Genetics, and a member of the Robert H. Lurie Comprehensive Cancer Center of Northwestern University. In previous work, Crispino and colleagues found that a gene on chromosome 21 called DYRK1A contributes to the development of leukemia. Now they expanded on that research by studying the gene in depth. Specifically, they wanted to understand how DYRK1A plays a role in blood cell production. Over-production of immature lymphocytes is a hallmark of acute lymphoblastic leukemia. 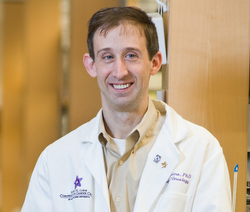 With first author Benjamin Thompson, MD, PhD, a postdoctoral fellow, Crispino generated a mouse model that lacks DYRK1A in blood cells. They saw that two types of white blood cells called B and T lymphocytes were severely blocked from developing without the gene. The scientists also found evidence that DYRK1A is normally responsible for regulating cell cycle progression in those lymphocytes. Because they have extra copies of chromosome 21, children with Down syndrome have more DYRK1A than usual.